I am honored to be a part of the events listed below. In the case of multi-day events, I have indicated the days of my presentation. Visit the event link to view dates, location and registration information. The Tragedy Assistance Program for Survivors (TAPS) Annual National Military Survivor Seminar takes place each Memorial Day weekend in Arlington. People who are grieving the death of a loved one in the military, whether a family member, friend or fellow service member, are invited and encouraged to attend the National Military Survivor Seminar. No matter where you are in your grief journey, support and connection await you. Heather will be offering three workshops during the event: Drawing your Griefscape, Relaxation and Compassion Meditation for Grief, and The Power Of Being Kind: Self-Compassion As Self-Care for Grief. If you can not attend this conference in person, this session will be available as a live web-cast. As bereavement professionals, we choose to provide whole-hearted care to those who are in need of compassion. However, tending to our own suffering is often placed on the back burner. Even when faced with our own personal loss and hardships, we often turn away from our grief and “push through” the pain. This can overwhelm our stress response system and in turn contribute to depression, anxiety, stress-related illnesses, and even lead to professional burnout. As hard as it may seem, we can tend to our own suffering using self-compassion techniques that are rooted in ancient spiritual practices and proven effective by contemporary research. Once we apply the “oxygen mask” to ourselves as professionals, we can then use the same techniques to support our bereaved clients who might be struggling with feelings of guilt, loneliness and low self-efficacy. This session will explore how self-compassion—in other words, simply treating ourselves as we would a beloved friend—can help us manage our difficult emotions, reduce our suffering, and exemplify self-care for both clients and colleagues alike. The presenter will review current self-compassion literature as it pertains to grief and professional burnout, discuss mindfulness-based interventions, and review a handful of case studies that will illustrate how self-compassion can support the bereaved client and grief professional alike. The good news is that if we skillfully turn toward our suffering, rather than suppress it, we can transform any difficult emotion into compassion. In turn, that compassion becomes inspired action that motivates us serve our clients, our community, and ourselves in a more whole-hearted and helpful way. We can even improve our health and feel more connected to our loved ones, those we serve, and the world at large. During this inspiring keynote, author Heather Stang will illustrate how mindfulness-based compassion practices can transform empathic distress into hope, connectivity, and action that is rooted in our shared human desire to be happy, safe, and free from suffering. Through motivational stories, a look at evidence-based best practices, and a brief period of guided meditation, attendees will learn how to be the spark and tend to global suffering with transformational loving-kindness and compassion. The holiday are considered the most joyous time of year for most! But for some, they are a challenging time following the loss of a loved one; or for those in a state of grief or bereavement. “I am excited to host this show near and dear to my heart and have invited field expert and one of my favorite professional colleagues, Heather Stang to join me in bringing this all-important topic to listeners!” said Holley Kelley of the Aging GreatFULLy Podcast. Visit www.CTRNetwork.com and click “Listen Live” on any page. You may also listen direct from your phone by dialing 401-347-0767. For more ways to access the show, visit: http://ctrnetwork.com/page/how-to-listen. You can also call into the show with questions yourself by dialing (844) 390-TALK. Self-Compassion: Managing Personal Loss in a Professional World: As bereavement professionals, we choose to provide whole-hearted care to those who are in need of compassion. However, tending to our own suffering is often placed on the back burner. Even when faced with our own personal loss and hardships, we often turn away from our grief and “push through” the pain. This can overwhelm our stress response system and in turn contribute to depression, anxiety, stress-related illnesses, and even lead to professional burnout. This workshop will explore how self-compassion—in other words, simply treating ourselves as we would a beloved friend—can help us manage our difficult emotions, reduce our suffering, and exemplify self-care for both clients and colleagues alike. Not only will you experience a guided self-compassion meditation and review current research on this crucial topic, but you’ll leave with simple strategies to make self-compassion part of your daily life. Monday: Relaxation Response Meditation for Anxiety, Grief & Stress: Focus-based meditation that reverses the negative effects of stress. Tuesday: Compassion & Lovingkindness Meditation: Heart-based meditation that cultivates self-compassion and acknowledges that all beings want to be happy, safe and free from suffering. Wednesday: Intensives Integration Meditation: Contemplative meditation during which participants will reflect on their experience at the Intensives, explore how the experience relates to their life and commit to an action step based on their experience. Heather will be participating in October’s Caregiver Teleconnection event.
. . . a free, bilingual, and confidential program that connects caregivers and family members to information and support through the telephone or “tele-learning”. The Caregiver Teleconnection provides learning sessions on a variety of useful topics, hosted over the phone by professional facilitators and experts. Family caregivers have the opportunity to connect and share with others in their situation during the sessions. Family caregivers know all too well how stress can impact on their minds and bodies. The good news is that your body has a powerful antidote to stress known as the “relaxation response,” which is the opposite of the stress response known as fight or flight syndrome. Join us for this session to learn easy easy ways to relax using “mindfulness” techniques. Speaker Heather Stang will do relaxation exercises based on a system developed at Harvard Medical School and her own experience and research. These techniques have been proven in studies to reduce a variety of stress related complaints, including some illnesses. 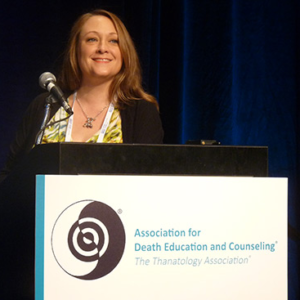 Heather’s message is grounded in research and her real world experience teaching and practicing mindfulness. From grief and caregiving to leadership and personal growth, Heather makes mindfulness relevant in today’s world even though the techniques are ancient. Mindfulness & Yoga Based Interventions for Grief. This fall the Chesapeake Life Center is introducing a day-long event entitled “Grief in the 21st Century”. Dr. Katherine Shear will be the keynote speaker, speaking on the topic of complicated grief. The Chesapeake Life Center is a service of Hospice of the Chesapeake in Anne Arundel and Prince Georges Counties, Maryland, and provides grief and trauma support and education to children, adults, families and members of the community. Heather will review evidence based literature and offer case examples to illustrate how mindfulness and yoga can be applied as a grief intervention for acute symptoms including anxiety, depression, insomnia and somatic disturbances. Best practices for developing partnerships with yoga and mindfulness teachers in your community will also be explored. 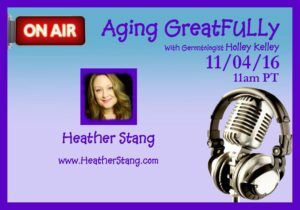 Heather will be a featured guest on Gerontologist Holley Kelley’s radio show, Aging GreatFULLy. Heather and Holley will discuss mindfulness, aging, and more. You can tune in LIVE on Friday, September 2nd, 2016. The air times are 11 a.m. PT / noon MT / 1 p.m. CT / 2 p.m. ET.